Harvard Apparatus offers a broad selection of syringe, peristaltic and continuous flow pumps to suit almost every application. Syringe pump models include new innovative pumps with the widest range of flow rates and forces of any manufacturer. This catalog includes detailed specifications and application-focused information, as well resources to improve your productivity and the versatility of our legendary pumps. 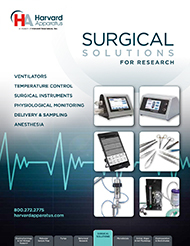 Harvard Apparatus’ comprehensive surgical catalog is dedicated to the needs of researchers assembling and maintaining a state-of-the-art surgical suite. From surgical instruments to vital signs monitors and ventilators, we have the tools and knowledge to ensure your procedures are successful. 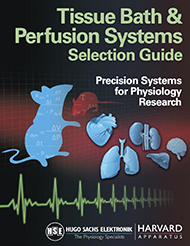 This comprehensive catalog presents Hugo-Sachs Elektronik's advanced systems for isolated heart perfusion studies. Systems for mouse, rat, guinea pig, rabbit, mini pig and pig are explained in detail. The systems featured in this catalog are modular in design, providing the flexibility to tailor a system or add applications as your needs change. Isolated Lung Perfusion Systems NEW! This comprehensive catalog presents Hugo-Sachs Elektronik's advanced systems for ex vivo lung perfusion (EVLP) studies. Systems for mouse, rat, guinea pig, rabbit, fetal pig and pig are explained in detail. The systems featured in this catalog are modular in design, providing the flexibility to tailor a system pr add applications as your needs change. 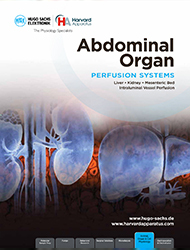 This easy-to-use catalog includes all the components needed to assemble an optimal organ perfusion system for your small animal liver, kidney, mesenteric bed, or intraluminal vessel perfusion study. The systems featured in this catalog are modular in design, providing the flexibility to tailor a system to fit your specific needs. This guide provides recommendations for selecting tissue baths and organ perfusion systems for various teaching and research applications. Each of 28 systems and their components are described in detail to help guide you to the best selection for your needs. Staff scientists available for system consultations. 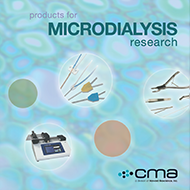 Industry-standard microdialysis probes from CMA, a leading provider for more than 25 years, plus instruments and accessories to assemble complete systems for your research needs. Includes system configuration guides and comprehensive probe information. 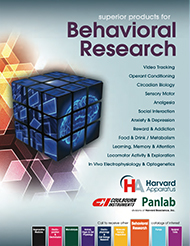 A comprehensive source for behavioral research products and applications from Coulbourn Instruments and Panlab, including video tracking, operant conditioning, circadian biology, social interaction activity and exploration, exercise, sensory motor, analgesia, learning and memory, attention anxiety and depression, reward and addiction, social interaction, food and drink intake, metabolism. Your source for thousands of products for physiology research using single cell, tissue, organ or whole animal models. Includes detailed information for assembling functional systems to meet specific applications needs. 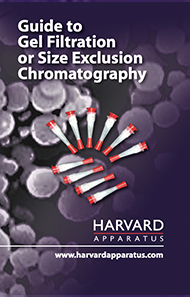 Harvard Apparatus offers innovative sample preparation technologies and CPK models. The broad range of products presented in this catalog can be used for separating small and large molecules, desalting samples, concentrating biomolecules, and sample clean-up for mass spectrometry and binding studies. 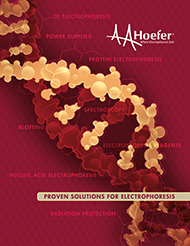 Hoefer offers a wide range of proven solutions for protein and nucleic acid electrophoresis. This catalog presents electrophoresis, blotting and sample preparation devices and accessories, as well as related reagents. Designed to support quality results and facilitate data collection, Hoefer product have been used in labs throughout the world for over 40 years. 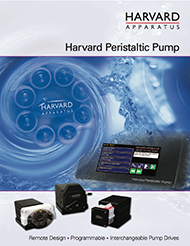 The Harvard peristaltic pump series offers unparalleled accuracy, reproducibility, and ease of use over a broad range of flow rates. Consisting of a control unit and a choice of motor drives, the pump can deliver solutions over a range of flow rates from 0.001 to 1,500 ml/min depending on the motor drive used. 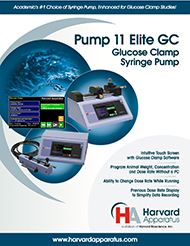 The Harvard Apparatus Pump 11 Elite Glucose Clamp Infusion System is a version of our renowned syringe pump technology enhanced for euglycemic or hyperglycemic glucose clamp studies in academia. The built-in software capabilities reduce the potential for error in your glucose clamp research by providing the most accurate fluid delivery available. 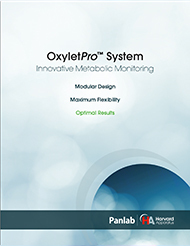 Learn about OxyletPro, an innovative system for metabolic monitoring in laboratory research models that utilizes indirect calorimetry to evaluate respiratory metabolism. This modular system combines respiratory metabolism (VO2 consumption/VCO2 production), food and drink intake, and activity/rearing measurements into one integrated system. 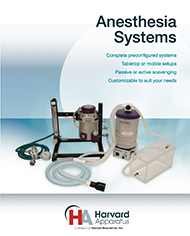 Overview of Harvard Apparatus' complete anesthesia systems. Includes tabletop systems for active and passive scavenging, mobile systems for passive scavenging, and associated vaporizers and filter canisters. This guide presents and explains two complete systems for isolating cardiomyocytes via Langendorff (retrograde) heart perfusion System components are recommended that yield high numbers of sterile cardiomyocytes compared to methods such as tissue dissection and manual dissociation. This guide explains the use of miniaturization to reduce sample size and experimental scale in many applications. Study smaller phenomenon and more variables simultaneously per time period to increase productivity. 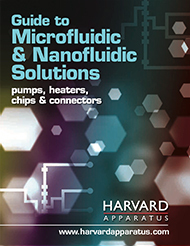 Harvard Apparatus products for microfluidics and nanofluidics are represented. 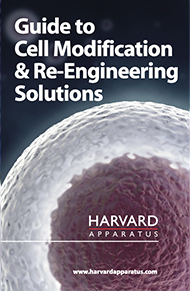 A guide to choosing the optimal techniques and tools for your cell biology application, focusing on cell modification and re-engineering. 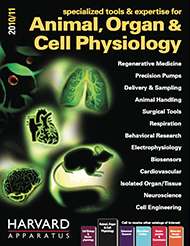 Includes an overview of specialized Harvard Apparatus cell biology products. This guide offers an introduction to the technique of equilibrium dialysis and some examples of how this technique can be used in real world applications. There is also an introduction to the types of data analysis methods used to extract results from these types of experiments. Includes the wide range of equilibrium dialysis products offered by Harvard Apparatus. A guide to protein and peptide sample purification to remove sales, solvents and protecting groups that can interfere with mass spectrometric or spectrophotometric analysis, to trace enrich small quantities of organism water, or to isolate products in serum. 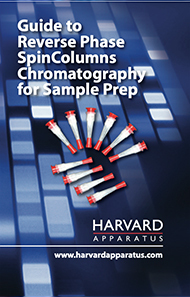 Harvard Apparatus SpinColumns offer a rapid method for sample cleanup to isolate and/or purify components of your sample. An overview of gel filtration techniques (size-exclusion chromatography) applied to protein and DNA purification, buffer exchange, desalting, or for group separation in which the sample is separated in two major groups. Includes application-based tips for selection of buffers, media and gel filtration columns. An overview of materials and methods used in ion exchange chromatography. Includes protocol samples, factors effecting selectivity, components of ion exchange media, experimental conditions and tips for methods optimization. 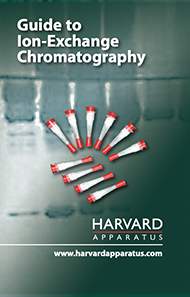 This applications booklet contains examples of neuroscience research experiments using Harvard Apparatus products. Summaries of the represented experiments and information about products used are included.